With more than double the number of stakes-winners of any other sire this season, Yarraman Park’s I Am Invincible enjoyed another super Saturday with a new stakes-winner in Crack the Code, an unbeaten Blue Diamond contender in I Am Immortal and the winning return of established star filly Fiesta. Exciting colt I Am Immortal produced another blazing display of sustained speed to win the Group III MRC Blue Diamond Prelude at Caulfield on Saturday for the Anthony Freedman stable. The colt won his only previous outing in the Listed MRC Blue Diamond Preview last month and took another step forward with this long neck victory over 1100 metres with Ben Melham in the saddle. 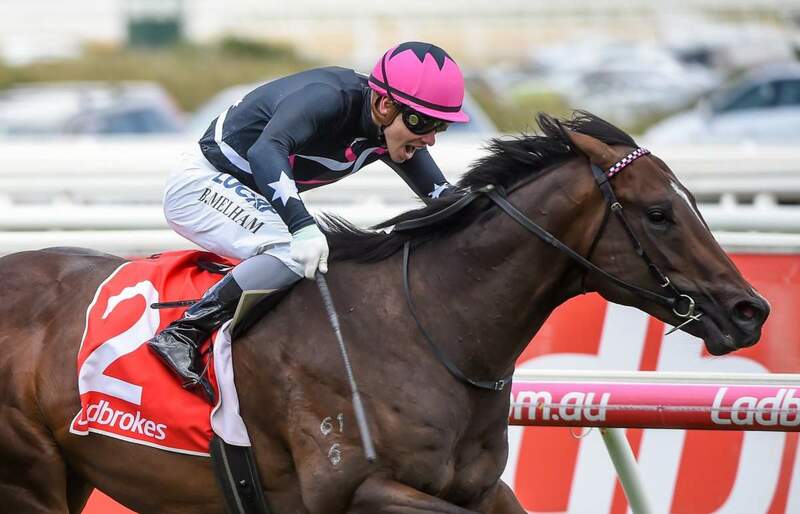 “He’s a very good colt this horse,” Melham said. “He just wanted to run through the bridle a bit in the middle stages and that just made him a little bit vulnerable late. “He’s still learning and he’s got a very bright future. A $200,000 Inglis Easter purchase from the Yarraman Park draft for Anthony Freedman Racing/ Dream Thoroughbreds, he has already won over $217,000 in prizemoney runs for a big syndicate and carries the Dream Thoroughbreds colours with Yarraman Park also sharing in his ownership. Bred by Yarraman Park in partnership, I Am Immortal is a three-quarter brother-in-blood to smart stakes-winning sprinter Whypeeo and is the first winner for Group II winner Meliora. Yarraman Park sold the current yearling from Meliora, a filly by Hinchinbrook, for $600,000 at Magic Millions to Boomer Bloodstock. I Am Immortal made it a winning stakes double at Cauflield for I Am Invincible, who struck earlier in the day with progressive three year-old filly Crack the Code winning the Group III Kevin Hayes Stakes over 1200 metres. Beaten only once in four previous starts, Crack the Code enjoyed the run of the race for Damien Oliver and was strong to the line to win by three-quarters of a length. “She’s a good filly, isn’t she?” said winning trainer Mick Price. “No need to go past 1200 metres with her, keep her fresh and we take her to the beach regularly enough. Carrying the colours of Darren Dance’s Australian Thoroughbred Bloodstock, Crack The Code advances her record to four wins from five starts with earnings of $283,000. She was a $170,000 purchase by Australia Thoroughbred Bloodstock/CB Bloodstock out of the Yarraman Park Stud draft at the 2017 Magic Millions Gold Coast Yearling Sale. Crack the Code is a half-sister to the Group I WATC Railway Stakes winner Covertly, Group III winner So Secret and stakes-winner Secret Link, being the 13th foal and tenth winner from 11 to race out of the 3-time stakes-winner Most Secret. A sister to WATC Listed Gimcrack Stakes winner Ebony Magic, So Secret died in May 2017 and Crack The Code is her final foal. Crack The Code becomes the 43rd stakes-winner for I Am Invincible who covered 223 of the cream of Australia’s broodmares last spring at a fee of $192,500. The day got even better for I Am Invincible in Sydney where quality filly Fiesta resumed from her summer spell to beat Golden Slipper winner Estijaab in the $1million Inglis 3YO Sprint. A brilliant winner of the Darley Princess Series during the spring, the Chris Waller trained Fiesta was well tuned with two recent barrier trials under her belt and surged to the line to win the 1200 metre sprint by three-quarters of a length for Glyn Schofield. “She’s such a versatile filly,” Waller said. “She raced as an early two-year-old through to a Golden Slipper. “She raced successfully as an early three-year-old and now has done it again as a late three-year-old. Waller was quick to give a lot of credit to Denise Martin of Star Thoroughbreds, who purchased the filly from Inglis Classic in 2017 for $150,000 out of the Fairhill Farm draft. “A typical Denise Martin product,” he said. “These big money races, they bring the people here, it’s what gets people watching at home,” he said. Bred by Mike O’Donnell of Fairhill Farm, Fiesta has won over $1.1 million in prizemoney and is the second winner from Now Now, a five time winner by Danehill Dancer (IRE) from the family of stakes-winners Charm Scene Land, Stick Around and Kingsgate. I Am Invincible is the leading Australian sire by winners and importantly stakes-winners with his 22 stakes-winners this season more than double the number of the next best sire.